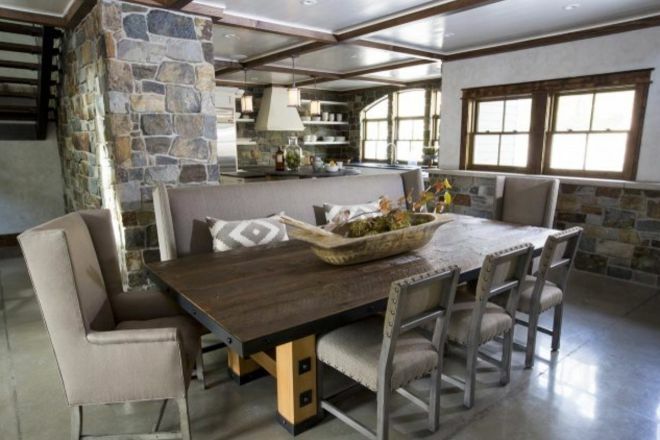 Using trendy gray and linen tones, this masterful stone farmhouse is a treasure of style, with rich natural finds of stone, oak and woven textiles. 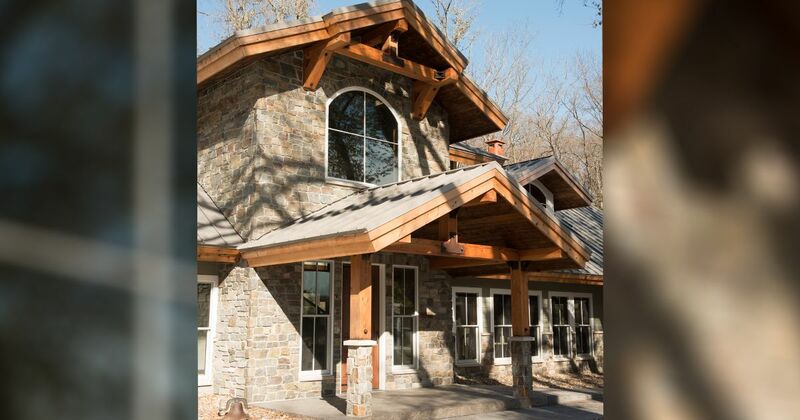 Each item is meticulously placed within the stone farmhouse home, creating a cohesion of natural country style. 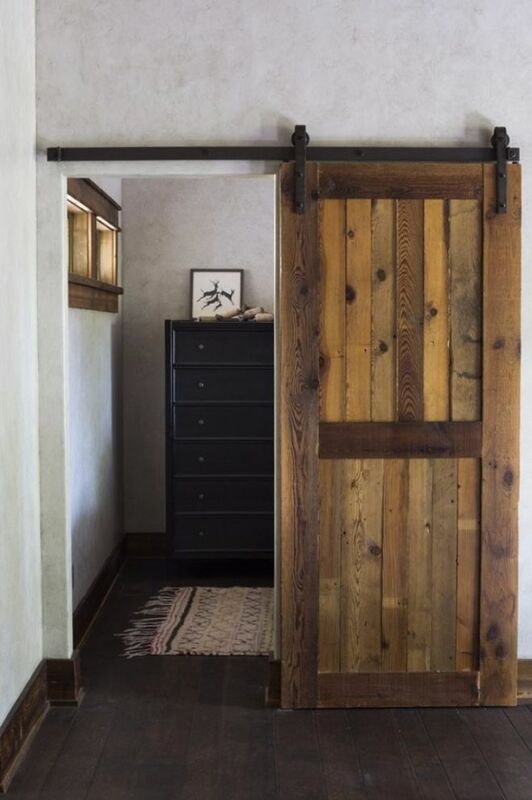 Reminiscent of barn building, the interior of the home, like its exterior, uses exposed building elements like river rock, exposed beams and timbered braces. Shocks of green plants are the only color contrast. Blending neutrals like grays and off-whites, this farmhouse style is understated, solid and inviting. Designer Rebecca Cartwright has a passionate respect for the use of artisanal textiles in her design and "has a love of antiques and vintage items." 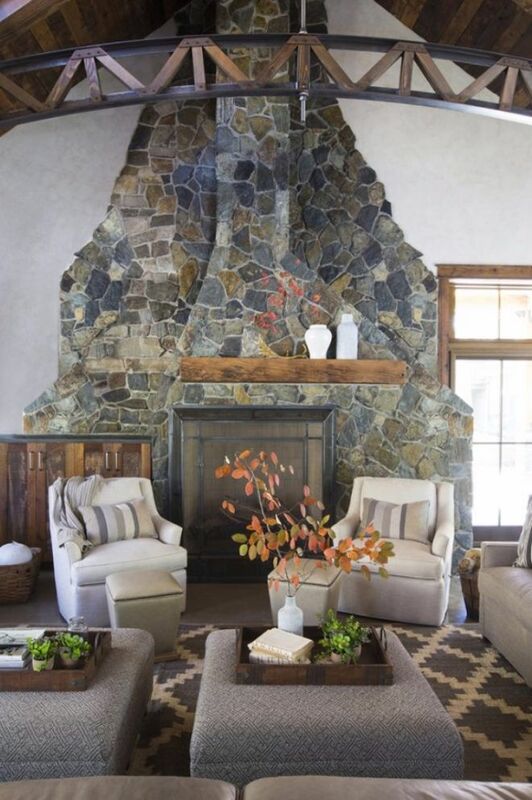 Both of these concepts are thoughtfully on display throughout this stone and timber farmhouse, starting with a living room that blends a rich chocolate and cream rug with vintage looking milk jug vases. Throw pillows of jute and chocolate design add contrast of color as well as a cozy invitation to lounge in comfort, feet bare on the South West-inspired rug. Surrounded by linen upholstered bench and chairs, Aa generous farm table holds enough room for feasts and family gatherings. Light wood on the benches, ecru cabinets, and gray to beige tumbled stone that frames the doorway create a warm, rich patina for the neutral toned kitchen. Exposed beams carry the solid design of exposed natural elements, suggesting that nothing here is fragile, this home was built to withstand the demands of entertaining and day-to-day living. Not yet a pie, a gold-green heritage pumpkin sits atop a porcelain and wood cake stand. Open shelving shows off the river stonework of the back wall. White veins of minerals meander within the charcoal soapstone counters, a choice that pairs well with rustic style. 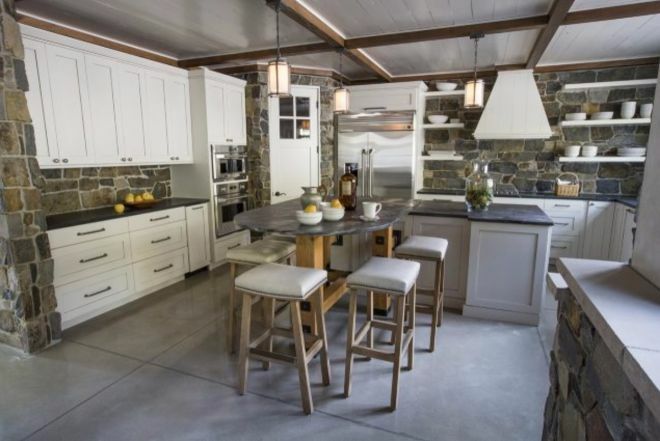 With room for several cooks in the kitchen, the soapstone counters carry over to the work-friendly center island. With a clean white ceiling, the use of heavy stones and dark wood does not close off the light from the kitchen. 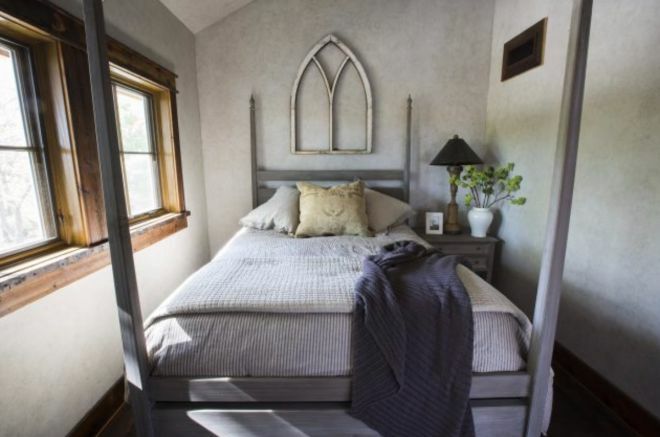 Upstairs, a gray-washed four poster bed is charmed with a gothic wooden frame above the austere headboard. 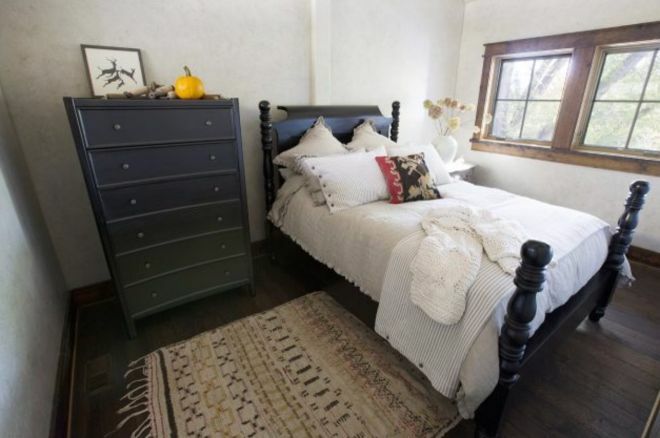 The use of woven textiles graces the other bedroom, which also takes use of crisp ivory cotton bedding against the dark black of a carved bed frame. A sliding bard door hangs elegantly on its wrought iron frame, sliding away to reveal a transom window and simple design of the bedroom. 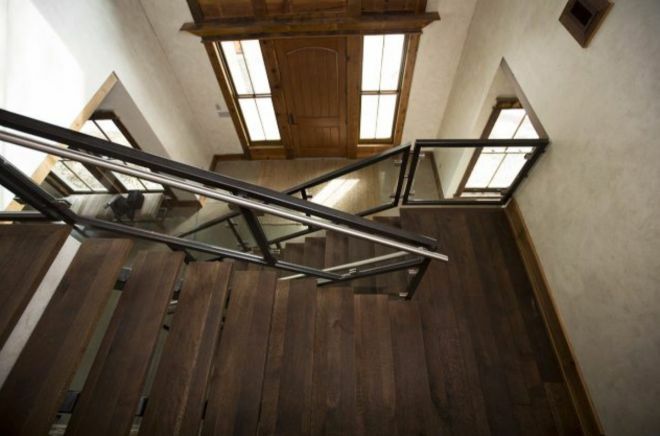 Criss-crossed stairs open up the wide entryway. 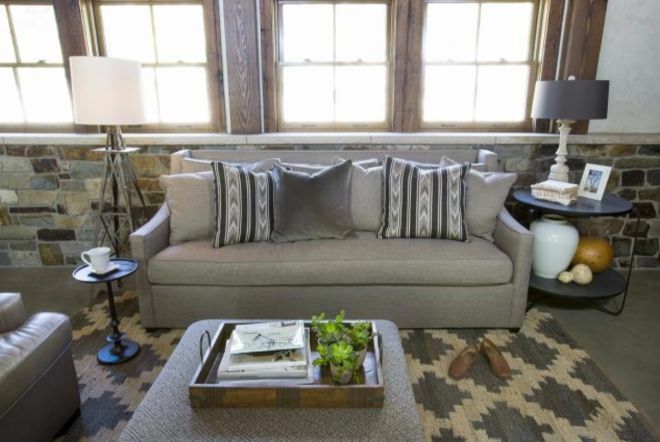 A view of the transom window from across the room also shows off a brown cow-hide rug, another touch of farmhouse style mixed with rustic, natural design.